IAM members in Washington, D.C. were among tens of thousands who marched in AFL-CIO ‘We Are One’ events across the country to show support for workers in states where collective bargaining rights are under attack. 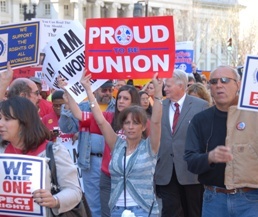 IAM members, retirees and headquarters staff joined more than 1,000 activists in Washington, D.C. to show solidarity with working people in Wisconsin, Ohio, Indiana and other states where efforts are underway to strip workers’ collective bargaining rights. The D.C. participants marched from the Treasury Department to the Washington offices of billionaire brothers David and Charles Koch, who spent $1.2 million in 2010 to help elect Wisconsin’s Scott Walker, Ohio’s John Kasich and other Republican governors opposed to collective bargaining for public employees.